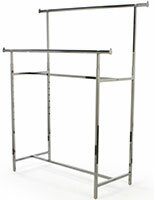 Trying to find durable and stylish clothing racks for high traffic retail areas? 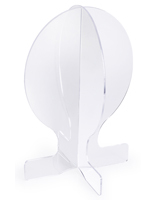 Our selection includes a wide variety of freestanding, wall-mount, and even countertop clothes display fixtures for sale that are durable enough to withstand heavy public use but also stylish and attractive to complement store decor. 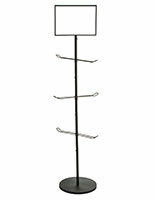 These metal garment holders are ideal for use as clothes shop, department, or boutique fixtures. 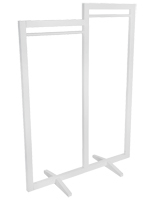 Portable, mobile clothing racks are lightweight even with steel construction and all weigh less than 30 pounds for easy in-store movement. 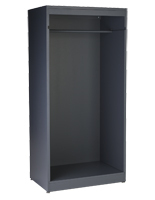 Many of these high visibility retail store fixtures feature installed or optional wheels and can function as rolling wardrobe displays to attract customer attention in retail establishments as well as to keep coats and accessories out of the way in commercial business environments. These high visibility clothing racks, often called garment holders, are perfect for use in retail outlets with heavy foot traffic. 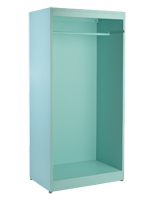 A variety of size options allows these versatile clothes display fixtures to accommodate entire lines, highlight sale merchandise, or showcase single attention grabbing fashion accessories. 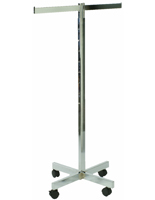 The rolling displays are also convenient for use as coat stands or coatcheck fixtures in professional and commercial business facilities. 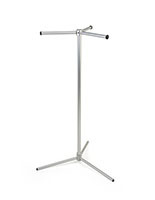 These versatile garment stands feature neutral chrome or black finish colors that coordinate well with many settings. 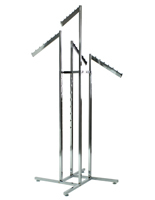 What are the various styles of garment display fixtures offered for sale? 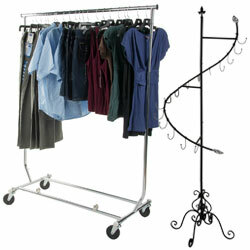 Metal clothing racks with faceout-style hanger rods are designed for showroom and sales floor use. 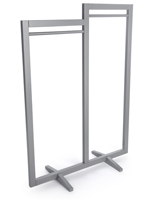 These freestanding garment displays feature sturdy aluminum construction and are available in a range of sizes from single to multi-rod fixtures. 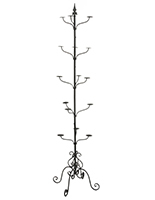 Straight and waterfall arm styles offer varying degrees of visibility to accommodate sale merchandise, full fashion lines, or grouped items. 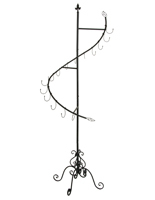 Styles range from simple round or square tubing to ornate wrought iron suitable for specialty boutiques. 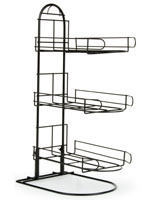 Commercial garment racks offer bulk display and storage, making these versatile fixtures a perfect accessory for many different professional uses. 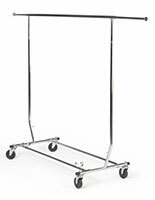 Durable steel and aluminum construction styles include portable rolling racks for showrooms, restaurants, hotels and other hospitality environments. 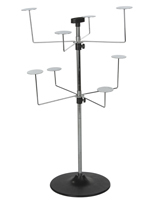 Multi-level clothes hanging stands with optional wheels easily serve as office coat-check furniture or professional laundry and dry cleaning storage. 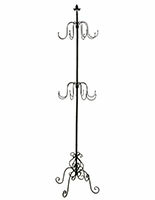 Coat stands and hat-rack styles include more than just commercial-grade merchandising displays with multiple hanging arms. 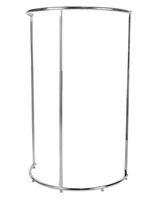 Our wide selection includes a variety of elegant freestanding poles with straight or curved hooks designed to complement any waiting room or office decor style. 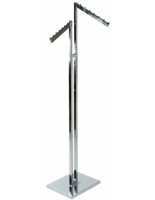 Specialty hat stands are available for sale in a range of sizes designed to meet any merchandising needs. 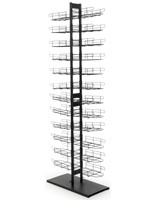 Multi-cap fitted hat racks can be found in freestanding and wall-mounted styles suitable for sporting goods or specialty boutiques. 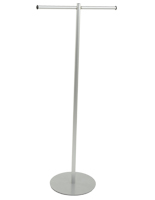 Countertop hatstands can accomodate everything from fashion headwear to point of sale impulse caps. 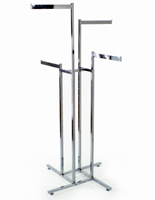 While retail stores, boutiques, and clothes shops are the obvious places where steel wardrobe stands are needed, many other businesses and industries employ this type of chrome garment hanger for less obvious uses. 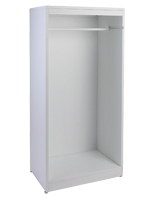 Dry cleaners, tailors, and laundromats use the single or double bar clothing displays primarily as storage units to hang wardrobes until owners come to pick them up or as complementary tools for customers. 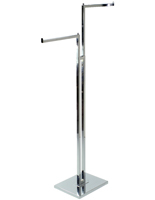 Restaurants, hotels, and theatres use mobile stands to check coats and hats while patrons enjoy food, shows, or receptions. 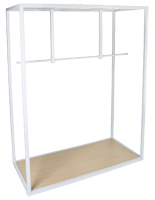 Fashion and costume designers need places to hang clothes when they are not in use and so these work well as portable storage that holds many wardrobe selections. 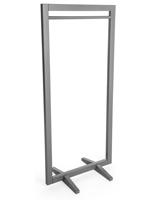 Our full selection of retail garment display fixtures includes a variety of accessories for pricing, labeling, and signage. 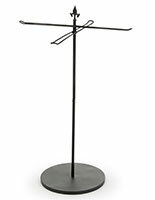 These versatile stands and clothes hanger holders are indispensible additions for businesses in many different industries. 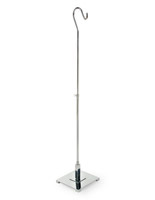 In addition to fixtures designed for in-store or in-office use, many models feature installed or optional wheels that not only make it easy to move the stands even when fully loaded, but also make them a great choice for off-site use at trade shows or other promotional events.